Earth has a problem. As good as the Doctor and his companions have proven to be in defending the planet from numerous threats, from the Daleks and the Cybermen to dinosaurs and demons, the travellers aboard the TARDIS cannot always be present. Fortunately, when the good Doctor goes off gallivanting around the universe and back, there is a single agency that stands against all of the aliens that would threaten humanity and has done for the last fifty years and will do so for decades to come – UNIT. Originally the ‘United Nations Intelligence Taskforce’, but since renamed the ‘Unified Intelligence Taskforce’, UNIT is the ultimate in NGOs, an international agency backed by every nation on Earth that commands regular military units, scientific research teams, and investigative teams. Its remit is to locate and identify alien threats; to study their biologies and technologies – and reverse engineer said technologies to further benefit Earth’s defences; and to take command of the militaries of Earth in order to defend the planet. Now you too can be part of UNIT – if you have the best to offer the Earth’s defences then you might be what UNIT is looking for! Or rather, now you can roleplay a member of UNIT with Defending the Earth: The UNIT Sourcebook, which offers an whole new campaign type to GMs and players of the Doctor Who: Adventures in Time and Space roleplaying game. In keeping with The Time Traveller’s Companion and The First Doctor Sourcebook, the other recent sourcebooks for the game, Defending the Earth: The UNIT Sourcebook comes as a solid hardback, fully illustrated and engagingly written. It presents a complete history of UNIT, rules for creating UNIT characters and facilities, expanded rules for guns and combat, data files on innumerable memorable members of UNIT, and of course two adventures. The history starts out with UNIT’s pre-history, discussing particular incidents before UNIT’s foundation such as the efforts of the Intrusion Countermeasures Group against the Daleks in 1963 and the Great Intelligence’s occupation of the London Underground in the late 1960s. Once founded, the history canters along touching upon all of the televisual appearances of UNIT, from its countering of The Invasion attempt by the Cybermen to the ‘Year That Never Was’ under the regime of The Master. The book as such does not directly mention particular Doctor Who stories; references are instead made enough that a GM in the know should be able to identify them with ease. It comes up to date with a complete description of the modern UNIT and its facilities, equipment, security clearances and document classifications. Pages are devoted to a description of the Valiant, the aerial aircraft carrier funded by the British government and of course, UNIT HQ UK. Along with various UNIT developed gadgets and new gadget Traits, the sourcebook allows the GM and his players to create a base of their own. This of course, begins by describing the base’s purpose and description so as to have some idea as to what sort of missions its staff, and thus the player characters, will undertake. Depending upon on the desired size, a base receives a number of points to spend on Good Base Traits, which of course can be added to by giving the base, Bad Base Traits. Ever since its foundation UNIT has had something of a rivalry with Torchwood, and one area where the two organisations have always clashed is Cardiff, specifically over who got to monitor the Cardiff Rift. In the end, Torchwood stood firm and maintained a base in the city specifically to keep an eye on the space-time rift and anything that came out of it. UNIT though, was still determined to monitor the Cardiff Rift and if it could not do so from within the city itself, it could from one of the points where the ‘end’ of the rift would frequently anchor itself – Glastonbury. OUTPOST MENDIP-1 is located beneath the offices and warehouses of Esoteric Supplies Direct, a wholesale supplier of all things ‘magical’, from dowsing rods and crystal balls to Tarot decks and wands. Its primary remit is the monitoring of the Cardiff Rift, but also monitors the comings and goings of various inhabitants and visitors to Glastonbury for anything ‘odd’. Given the nature of the things that might come out of the Rift, it was decided that the outpost needed access to UNIT’s database, a laboratory to study whatever it was that came out, and somewhere to hold them. Given the effect that the Cardiff Rift sometimes has on the local power infrastructure, the outpost has its own power supply. Currently, Commander Wyndham is the chairman of Esoterica Direct Supplies and head of OUTPOST MENDIP-1. It is his first assignment to UNIT and he is finding having to adapt to being both a civilian and a military man something of a challenge, let alone commanding scientists rather than military men and directing the delivery of magical gewgaws rather than Her Majesty’s naval assets. Nevertheless, he believes himself up for the job and this posting a stepping stone to a better role, if not promotion. Fundamental to UNIT are its staff and Defending the Earth: The UNIT Sourcebook gives the data files for a wide array of NPCs. These include typical members, from UNIT Privates and UNIT Privates (Experienced) right up to the Brigadier, the ranking officer in the United Kingdom. These are accompanied by data files for UNIT’s most notable members, starting naturally with Brigadier Lethbridge-Stewart, the Third Doctor, Liz Shaw, Jo Grant, Sergeant Benton, and Sarah Jane Smith, and coming right up to date with Professor Malcolm Taylor and Captain Erisa Magambo. Guidelines are included that players to create their own characters. These still use the rules from the Doctor Who: Adventures in Time and Space roleplaying game to which are added a selection of new Traits, of which the inclusion of Five Rounds Rapid (Major Good Trait) is obligatory. It enables a character to leap to up the initiative order and attack when ‘Talkers’ or ‘Doers’ act. Our sample character is Flight Sergeant Brian Beasley, a UNIT veteran who has spent his career shuffling back and forth between assignments with the RAF and UNIT. In over thirty years he has seen everything and faced down numerous alien threats – Daleks, Cybermen, the Slitheen, the Korasterack Incident, and more… Along the way he has lost friends and colleagues, and he now approaches the job with a sense of weary necessity. He has lost his sense of wonder at the universe and what it has to offer, and is really beginning to look forward to a happy retirement. So he was pleased to be assigned to the quiet OUTPOST MENDIP-1 where he could spend his last few years in relative peace – well, relative for UNIT that is… His relatively easy going approach is unfortunately at odds with the more forward thinking attitude of his new commanding officer, Commander Wyndham. In comparison to normal games of the Doctor Who: Adventures in Time and Space roleplaying game, a campaign involving UNIT will have a more ‘bullish’ approach to it and this is reflected in the new rules for combat. These expand upon the details for firearms and their use, for explosives, and for handling battles. In comparison with other RPGs, the new rules for firearms are not as detailed, but they do add rules for range and gun types. This being the Doctor Who: Adventures in Time and Space roleplaying game, guns are still deadly, but they are a necessity in a UNIT game. The new Mass Combat rules handle the type large engagements that UNIT is expected to handle in the twenty-first century and as you would expect allows for the involvement of player characters and keeping everything dramatic without overcomplicating things. One last issue that UNIT has to deal with is that of ‘Public Relations’, or rather covering up the fact that a local Job Centre has been infiltrated and is a front for a Zygon operation. Mechanically, this is about coming up with a good cover story that will counter the various sources of exposure, and in keeping with the game, the rules are kept simple. As noted earlier, campaigns involving UNIT are more bullish than is standard in the Doctor Who: Adventures in Time and Space roleplaying game. It being a more team based RPG and a military themed RPG means that a UNIT campaign deals with themes of loyalty, bravery, and morality. Several campaign types are suggested, such as exploring off-world, First Contact, artefact recovery, conducting research, and more. These can be built around a single type of character, such as soldier or scientist; around UNIT Freelancers who investigate small incidents, but on a casual basis; or around UNIT CRASH (Critical Response and Special Handling) Teams, that respond to emergencies and secure sites of alien incursion. These ideas are accompanied by scenario seeds in addition to the UNIT Crisis Generator! Rounding out Defending the Earth: The UNIT Sourcebook is a pair of mixed group adventures. Physically, Defending the Earth: The UNIT Sourcebook is very nicely presented with plenty of photographs taken from the television series. It does need an edit in places, but overall the book has an engaging tone and throughout there are some jolly little touches – the list of UNIT briefing documents is ever so slightly tongue in cheek as is the section on Britishness. Sooner or later, Cubicle Seven Entertainment had to publish a sourcebook for UNIT for the Doctor Who: Adventures in Time and Space roleplaying game and in Defending the Earth: The UNIT Sourcebook, the ‘sooner’ has been worth it. Although its primary focus is on playing UNIT during its more modern incarnation, the inclusion of stats and write-ups of the Third Doctor and the Brigadier – the latter both for when he was in command of UNIT in the United Kingdom and after he retired – enables a campaign to be set in the past, or at least pay it a visit. This is an engaging sourcebook that does a good job of developing the material presented on the television screen without overdeveloping it whilst presenting a book full of ideas and possibilities. 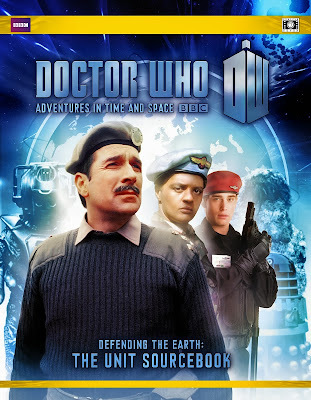 Together these can take a Doctor Who: Adventures in Time and Space roleplaying game in a whole new direction – the defence of the Earth.